This is amazing and great quality love it!!!!! Say 'I love you' with this elegant three piece bridal ring set from the Miadora Collection. This wedding set features an engagement ring with a cushion-cut created white sapphire center stone surrounded by a halo of smaller round created white sapphires and additional sapphires along the band. 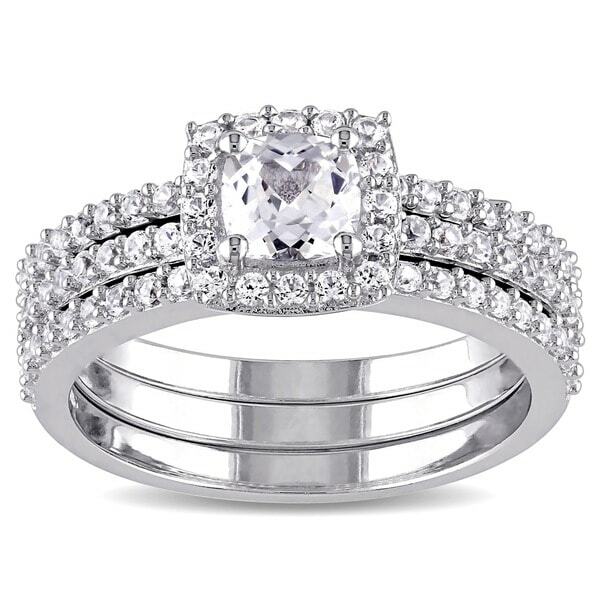 This magnificent bridal set is complemented by two stackable anniversary style wedding bands. The wedding rings are set in sterling silver and enhanced with a high polish finish. This stunning bridal set is the perfect choice for your bride-to-be and is sure to make her stand out on her wedding day. All weights and measurements are approximate and may vary slightly from the listed information. Treatment code CR (Created White Sapphires). See Treatment Guide for further information. i don't take it off for anything, dishes, shower, its always on. the stones after about a month get somewhat cloudy, and the band shows typical wear. other than that it's gorgeous. i can't easily slip something over my knuckles and i want something i don't have to 'baby' so for how i treat my jewelry it's a great buy for the price. The Miadora Sterling Silver Cushion and Round-cut Created White Sapphire Halo 3-piece Bridal Ring Set, it is just beautiful. I bought a bridal set from you guys and my fiancée loved it. The delivery was great and the ring was not damaged at all. I'll be ordering from you again in the near future. Thank you again for the wonderful and great service. I was super surprised at how much I liked this set. The white sapphires truly make this ring look like a authentic diamond bridal set. I needed something that looked real but I could trade out with my real set for traveling and such. Great choice. My wife and I wanted matching sets. She doesn't like gold or diamonds and I have to admit, I love diamonds and gold. 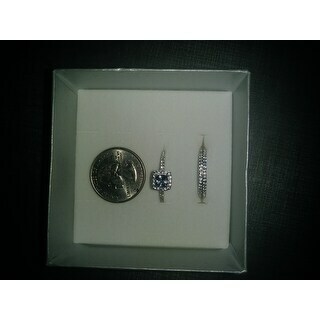 These sterling silver and sapphires really make me question the need for diamonds. The center stone is amazing and the chips that surround on the bands are amazing accents. Great quality for the price! This is a very pretty set and 3 pieces are hard to find. My Husband and and I have been together 42 years. We want to review our vows and having this third piece is wonderful. This is a very dainty (small) size but is ok in size 5. I wish it were a little larger but it is a nice set for the price. 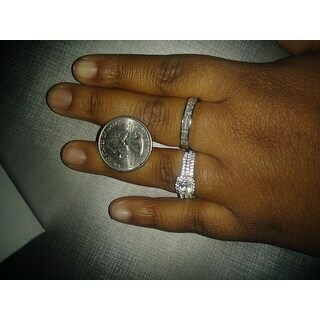 I ordered this ring as my wedding ring. And not only is it gorgeous but the quality is quite fantastic. I got a great deal on this ring and people think we probably paid at least several hundred. It's beautiful and I am so happy with it. Definitely will recommend again and again. The ring is very nice. Has a good shine to it. Unfortunately we had to return it do to it being the wrong size, it was a little to big and spun around on my fiancé's finger. This ring is lovely! Exactly what I've been searching for, yet so affordable. Thank you, Overstock! Amazing ring, i give it to my wife she loved it could not stop smiling. The ring is beautiful! Runs big tho. I'm having to exchange it for a smaller size, not happy about that. Otherwise I'd give it 5 stars. It looked bigger in the picture. I wasn't satisfied with it, but my fiancee liked it. This ring is very flimsy even with the other two bands. I would not recommend this ring to anyone. The band would not stay on the ring finger. I wasn't please with the quality of the ring. Beautiful ring. A little larger than I wanted but I enjoy wearing it when out. Perfect ring to wear while traveling and keep the real deal at home. Beautiful ring. I wanted a very believable look and this ring fit the bill. I paired it with an expensive eternity band. Beautiful look. This was a wedding rings for my son and his bride. He got married and because I was so happy and proud I decided to purchase the rings for them to avoid worry and stress of buying rings. "Will you get this in a size 8 anytime soon?" "I'm not sure about my ring size. how might I determine that?" Hello Ree, use our ring size chart to help you measure one of your existing rings. (http://www.overstock.com/downloads/pdf/2010_RingSizing.pdf) If you have a ring that fits well but you can't remember the size, print out our chart and place it on the circles until you find the one that matches up. Before you print it, make sure you have your printer set to 100 percent. You can place a quarter on the page to make sure that you have printed it out correctly. The ring sizing chart works with a PC or a Mac. Thank you for shopping with us. "Could I get this ring in a 8 1/2 ?" Hello Tina, unfortunately, this ring is only offered in whole sizes. It can be re-sized by a jeweler. Please let us know if you have additional questions. Thanks for shopping with us. A just because gift for my wife!!!! I love her!!!!!! It is very beautiful and simple and just what I was looking for when it came to my wedding set. It's a surprise birthday present! shhhhh! Top 5 Reasons to Consider Bridal Sets from Overstock.com. Our guides provide customers with the top 5 reasons to consider bridal Sets.